Vulture capitalism is the ideology of our age, supported by the vast bulk of the political and media elites. The corporation has become more powerful than the state. And yet its work is often done by stealth. Privatised war and outsourced detention centres. Mining companies pillaging precious land in developing countries. Struggling nations invaded by NGOs and the corporate dollar. 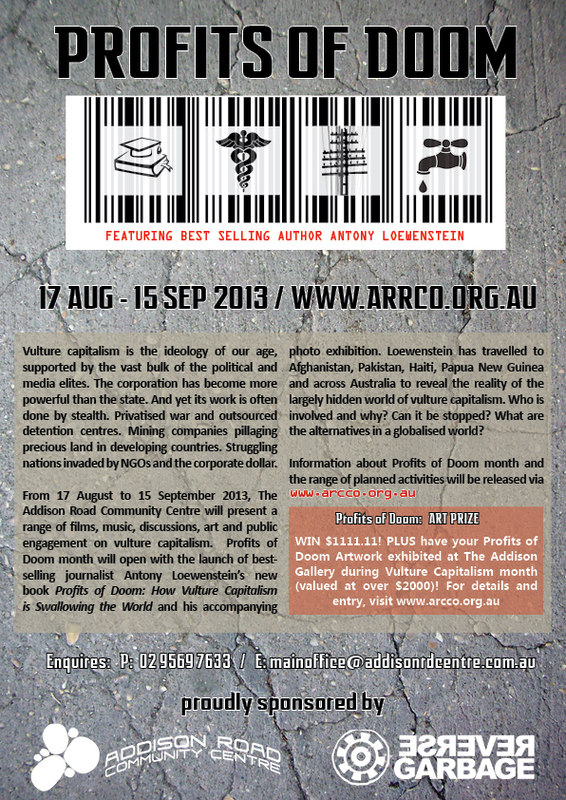 From 17 August to 15 September 2013, The Addison Road Community Centre will present a range of films, music, discussions, art and public engagement on vulture capitalism. Profits of Doom month will open with the launch of bestselling journalist Antony Loewenstein’s new book Profits of Doom: How Vulture Capitalism is Swallowing the World and his accompanying photo exhibition. Loewenstein has travelled to Afghanistan, Pakistan, Haiti, Papua New Guinea and across Australia to reveal the reality of the largely hidden world of vulture capitalism. Who is involved and why? Can it be stopped? What are the alternatives in a globalised world? Profits of Doom Art Prize – you could win $1111.11 and have your artwork exhibited at The Addison Gallery! A call for entries is now open for art works of any format that reflects vulture capitalism (or otherwise known as disaster capitalism) and the effect it is having on our global community. Next Next post: Support reuse – RG ReStore items at Reverse Garbage!